The Desert of Burning Sin by Steve Carter and Antoinette Rydyr Awarded Third Prize Best Feature Film Screenplay at the A Night of Horror International Film Festival 2011! Special thanks to the organizers, judges, sponsors and supporters. Any enthusiastic filmmakers with a genuine passion for horror/SF & fantasy interested in learning more about THE DESERT OF BURNING SIN please contact us! THE WORLD CAN GO TO HELL! Synopsis: A war between humanity and the Nether-Realm is consuming the Earth and terraforming the landscape into a surreal Hellscape. 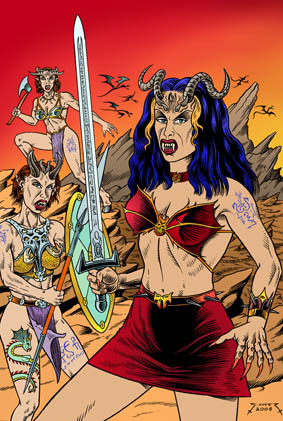 Wade and Wandella fight alongside a band of Cleansers – religious warriors – against the demon hordes that are pouring in through portals. During a critical battle Wade is killed and awakens in the Nether-Realm –The Desert of Burning Sin – where he discovers that there are Cleansers continuing to fight the countless “forces of evil”. Some Cleansers have even mutated into Psysmic Moles, having evolved their psychic abilities through years of meditation. Wade must face the ever present horrors of a legion of hellish adversaries including the Vampyratrix, Apocalypse Harpies, Lamias and his own personal demons. Trapped for all eternity, Wade realises the battle has just begun.